Nibiru is a set designed for the Brooklyn Academy of Music, consisting of 164 strips, made from polyethylene fibers, totaling 2,368 feet in length. While resulting from the arrangement of light materials and minimal resources, Nibiru evokes the strong presence of a mass that is able to engage with the vast space of the main opera house. The strips are hanging from pipes connected to a circular truss, 32’ in diameter. The truss is itself rigged to the stage grid with 5 chain motors allowing Nibiru to fly in and out of the proscenium or stop at predetermined intermediate positions. As those movements occur, the sphere always seems to only be shown partially, suggesting an even larger mass and evoking a space that would extends far beyond the stage. 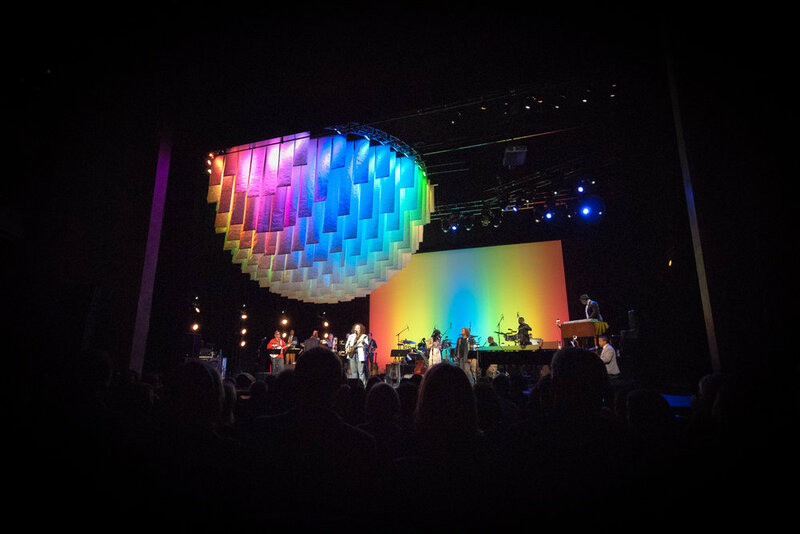 A live mix of specifically designed videos, utilizing the latest projection mapping techniques, seamlessly wraps around the spherical volume that seems to directly face each seat in the audience. Beyond the surface, color dynamic LED installed amid the strips emit a bold glow that can travel within the depth of the mass. Nibiru is a constantly evolving set that is precisely choreographed to directly respond to the performance.